Learn the Art of Southern Biscuit Baking with Nashville's leading biscuit expert Maryann Byrd in her quaint Southern Belle Biscuit Kitchen. In this class, Maryann shares the history, baking tips and tricks, of the culinary icon of the South, the Southern biscuit. 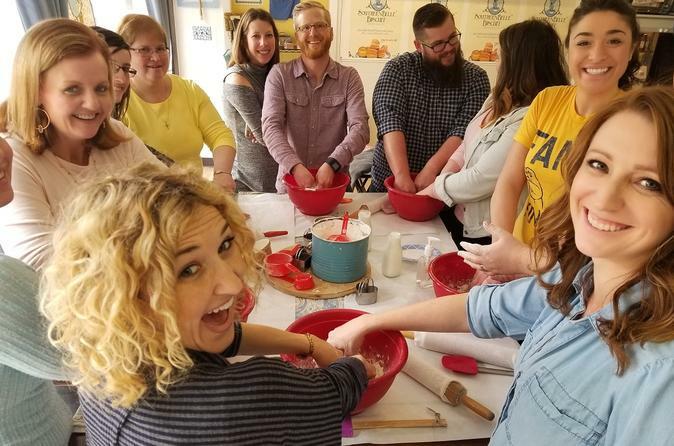 In the Biscuits & Breakfast class, you will eat hot fresh biscuits as you watch the process of Southern biscuit-making demonstrated from start to finish. It is a fun, relaxed, tasty time! You will be served two of Maryann's favorite biscuit recipes, including her Southern gravy of the day. A hands on biscuit lesson is included, and you leave with your own batch of homemade biscuits. Maryann Byrd won two EMMY® awards and three Telly awards for her PBS Documentary , The Rise of the Southern Biscuit. She also authored the book The Biscuit Dive Guide. Southern Belle Biscuits & Breakfast classes begin with a live demonstration of biscuit recipes. You will eat as you learn the techniques, tips, and tricks to the art of Southern biscuit baking. You will be eating two biscuits and the Southern gravy of the day. The second part of class is a hands on biscuit-making lesson. Southern Belle Biscuit Shop is located at 1100 Elm Hill Pike Suite 170, Nashville, TN 37210. Conveniently located just a five minute drive from downtown Nashville, and a 10 minute drive from the Nashville airport. Doors open promptly at 10:00am, so no need to arrive early. Classes are approximately 2.5 hours long.